Sit in the cockpit and take off on an uncontrolled adventure... 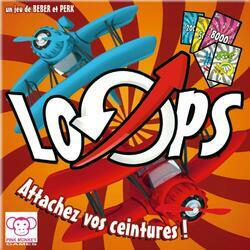 In LOOPS, players fly the same aircraft together, taking turns controlling its altitude and direction. Each map represents an altitude (between 1000 and 9000 meters) or a special map. The players take turns placing one (or more) card(s), respecting the current trajectory (altitude higher or equal during an upward trajectory, lower or equal during a downward trajectory). Keep the right cards in your hand so you never get stuck. Trap your opponents by changing the direction or attitude of the plane using special maps. Be the first to run out of cards to win the game.